A woman was dragged from the floor of the West Virginia House after she began reading a list of their names and how much money they have received in donations from oil and gas companies. Common Dreams reported over the weekend that lawmakers in West Virginia dragged House of Delegates candidate Lissa Lucas from the house floor as she read off a list of donations received by House members from the oil and gas industries. The incident occurred during an open hearing last Friday and was captured on video (at the bottom of the article). “And the people who are going to be voting on this bill are often also paid by the industry,” Lucas said. As I tried to give my remarks at the public hearing this morning on HB4268, in defense of our constitutional property rights, I got dragged out of House chambers. 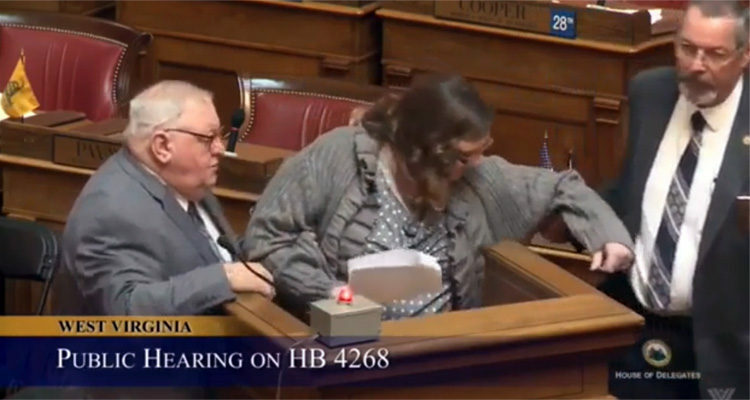 At that point, she began reading off her list of donation to four members of the West Virginia House of Delegates before her mike was cut off and she was eventually evicted. WV LAND & MINERAL OWNERS PAC $250.00 The WV Mineral Owners Coalition is AGAINST this bill. This PAC is unrelated appears to be a front for out-of-state resource barons and attorneys who represent the energy industry.